The function of the neuromuscular systems depends upon transient electrical signals emerging from nerve cells and highly localized synaptic sites and the interactivity of nerve - muscle connections and control mechanisms. Command and control signals are generated by voltage-gated ion channels in excitable membranes and ligand-operated synaptic receptors, which are the fundamental signaling units of the nervous communications network. Via ascending and descending pathways in the spinal cord , the brain and spine oversee and control all voluntary and co-directs a large component of involuntary activity in the human body. Neuroelectrodiagnostic services are a sub-speciality discipline of Physiatry & Neurology. It is based on our understanding of nervous and muscular system pathophysiology and utilizes the principles of bio-electricity, bio-physics and computer electronics to provide through specialty instrumentation a much more measurable and reproducible sense of the function / dysfunction of these systems; Thus, neuromuscular electrodiagnostic examinations serve as an extension of the clinical exam and are useful in improving the accuracy of diagnosis and prognosis in different illnesses presenting with pain, weakness and sensory loss. Such investigations are a necessary addition to imaging studies. Modern computer-based equipment has streamlined and facilitated such studies, thereby benefiting the patient and physician alike. Orthopedic Surgeons, Neurosurgeons, Rheumatologists, Internal Medicine Specialists and many other disciplines of medicine depend on the outcome of neuromuscular electrodiagnostic studies to manage their patients. Neuromuscular electrodiagnostic studies are collectively know by the acronym EDX. Electromyographic ( EMG) studies: During an EMG, the physician analyzes the electrical activity in the muscles by inserting a fine needle electrode into selected muscles. The needle is not used for injection and no shocks are given. The physician can determine whether the muscle and neuromuscular junction is working normally by noting the electric activity on a screen and listening over a loudspeaker. 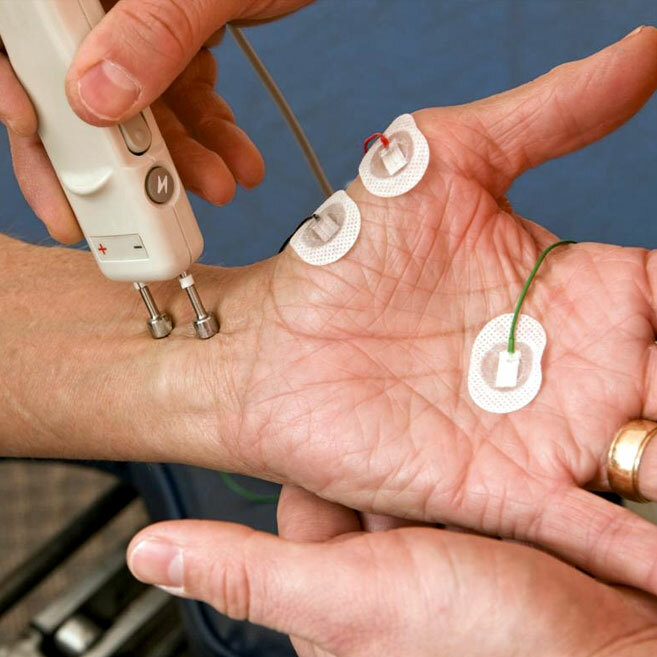 Nerve Conduction ( NCV or NCS) studies: To perform nerve conduction studies, the physician applies small electrodes on the skin and further applies a brief electric stimulus to one or more portions of a nerve. Nerve stimulation will cause a tingling sensation. The physician can then evaluate the electric response of the nerve or muscle to which the nerve is attached and determine if the nerve impulse is (a) conducted normally, (b) at a slow speed, or (c) not transmitted at all, suggesting damage to the nerve or higher control centers. Other parameters such as size and dispersion of responses and comparative analyses of many nerves are important to allow for meaningful conclusions in these studies. Somatosensory Evoked Potential ( SSEP) studies: Somatosensory evoked potential studies allow for the assessment and measurement of ‘long loop’ and ‘far-field’ nerve action potentials and conduction characteristics. Thus one can study the continuity of the spine or taking advantage of the amplification of such potentials in the central nervous system better delineate subtle changes in the peripheral or central nerves. Recordings are made principally over the somatosensory cortex (measuring both ‘near-field’ and ‘far-field’ potentials) and stimulation is generally peripheral over the extremities, trunk or face. Results: The Physiatrist interprets the results of the studies. Afterwards as applicable a report is sent to the referring physician who will then be in the position to coordinate with the Physiatrist further treatment.